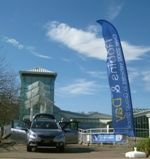 Guildford Spectrum can offer a wide range of facilities and services for corporate customers. We offer a comprehensive membership package which includes use of the gym & spa, group exercise & fitness, squash, athletics track and more. For more information please call our membership team on (01483) 443337. We offer an upgrade to your Corporate Membership for a Guildford Lido Season Ticket. For more information please call us on (01483) 443337. 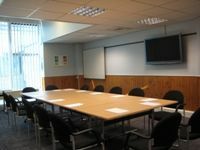 We have a conference room which can accomodate upto 35 people or several hospitality rooms which over look the ice rink which are perfect for your meeting or conference. Catering can be provided. For more information please vist our Events and Conferencing section or call The Sports & Events Department on (01483) 443320 or email info@guildfordspectrum.co.uk and let us know what you're planning. There are many opportunities for you to advertise your company at Spectrum, some of which you may have thought of and others which are a bit more unique! The beauty of our offering is that we have 1.7 million visits each year from all over the South-East and our core market is ABC1 families who are taking part in leisure and entertainment. Listed below are just some of thye opportunities but we can tailor your advertising and marketing needs to fit your wants and needs. We have a huge footfall coming from a wide catchment that are in an ideal situation for you to market your products and services. We''ve worked with several brands including Coca-Cola, Mars and Ericsson to promote and launch new brands into the marketplace as well as smaller more local companies, car dealerships for example. Please do call to discuss what is available and whether Spectrum can work for you. We have various locations where you can display your ambient marketing material with 60" by 40" poster sites. Packages are available for 6 or 12 month periods. Double sided, various locations. 4460mm x 1500mm. 12 month contracts available. 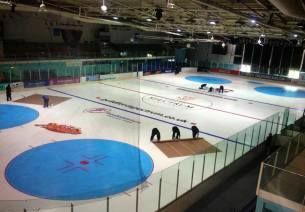 Within Spectrum ice rink we have both rink boards and ice logos. All prices are available upon request. For more information please call the Marketing Department on (01483) 443322.